Texas native Cristina Luna is making waves in the field of student affairs. A graduate of the M.Ed. 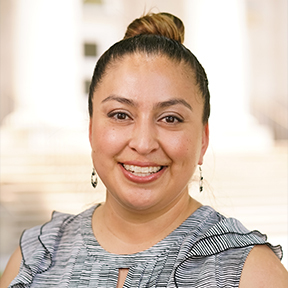 in Student Services in Higher Education program at UIW, Luna is currently an Assistant Dean of Students and Director of Greek Life at the University of Miami. In reflecting on her time as a Cardinal, she acknowledges it helped carve her career pathway and pursue her passion. “I have been blessed to meet one of my career goals. Upon entering the field, I quickly learned it isn’t easy navigating your next move in higher education. It takes courage, being vulnerable, and a lot of risks to put yourself in the competitive market. This was a blessing in disguise and I am very happy to be part of the Cardinal Family,” said Luna. Fast-forward five years and Luna is now pursuing her Doctorate of Education in Organizational Change and Leadership at the University of Southern California. “After a few years of contemplating pursuing my Ed.D., I took the plunge and applied last spring. It was a scary moment for me as I was quick to over analyze the future stress this could bring. Yet, I was beyond excited when I was accepted,” explained Luna. She credits mentorship and support throughout her educational career as beneficial to her reaching career milestones. “Dr. Herbers [UIW Professor in the Dreeben School of Education’s Graduate Studies Department] was flexible with my interest in doing my practicum out of state and supported me traveling to Florida State University to intern with the Office of Fraternity & Sorority Life.” Now, she finds support from her supervisor, mentors, a group of Latinas pursuing doctorates on Facebook, friends, and her parents. Luna acknowledges it is a process and an important decision on whether to pursue a graduate degree and where to do so. She encourages the journey. “As an independent and single Latina women, I have faced many criticisms on moving far away from home, not having children, and being alone (unmarried). My parents instilled a force in me to be a strong, and independent woman growing up and I know I have made them proud. I look forward to the #Journey2DrLuna,” said Luna.